like half the restaurants give you an extra sad hash brown....which is defiantly from the freezer section. (I swear half the restaurants order them from the same supplier). Soooo i kinda prefer cooking breakfast at home, also that means you can stay in your pjs. 1. Finely chop shallot, jalapeño. 2. Chop cherry tomatoes into pieces. 3. Cut avocado in half remove seed and slice into cubes and scoop out avocado out of skin. 4. Juice lime, remove seeds. 5. Slice radish into very thin rounds. 1. Warm tortillas in frying pan for about 30 seconds each side, keep warm in tea towel. 2. Heat oil in skillet, fry eggs either sunny side up or flip if desired. 3. 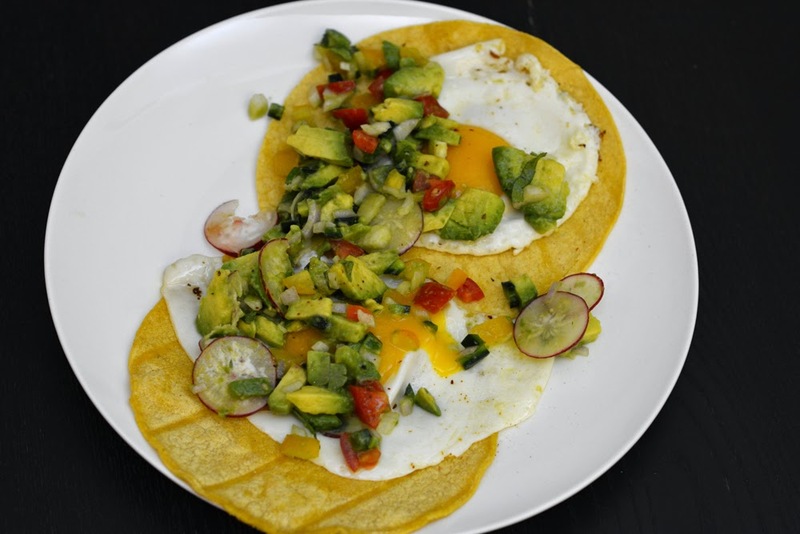 Lay warm tortillas on plate, place fried egg on top and spoon avocado salsa on top. 4. Season with doe freshly group salt and pepper.